Autograph Letter Signed (ALS), 4 pages, 4to, Harpers Ferry 3/19/65. 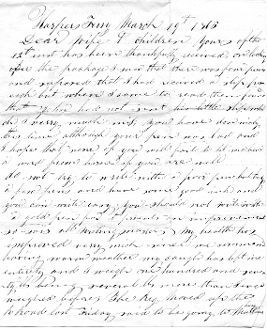 Soldier Parris M. Law (Co. K, 18th Connecticut Infantry) writes that the regiment is in the move to Martinsburg. We have voted in the field so that there will not be much prospect of getting home this April...The Regiment voted most all for Buckingham ...Parris M. Law.". Bottom of page 3 & 4 cut away by soldier for further paper use but text on upper portion complete. Some edge splits, otherwise fine.